When Mark Olcott was working as an emergency veterinarian he was perpetually jumping through hoops. Patients were visiting him left, right, and center after hours and on weekends when their regular vet was closed, but he was unable to access any of their pets’ medical records. As the problem persisted Mark knew he needed a solution, and the ability to bring veterinary medicine into the 21st century. He found it at business school, in the MBA at the University of Maryland’s Robert H. Smith School of Business. While there, he met Kalpesh Raval, an Executive MBA student at the Smith School with a background in computer science. The two of them would go on to co-found VitusVet, an app that provides a digital bridge between veterinary practices and pet owners, after graduating in 2013. “I went back to school with a big problem, but no idea how to solve it, and I met somebody who’d made a career out of solving problems like that but didn’t know this problem existed,” Mark explains. Their solution is a cloud-based software system that gives pet owners access to their pet’s medical notes, vaccines, prescriptions, and x-rays at the touch of an app. Mark adds that it’s easier for clients to request appointments or refills, and even reminders for their pet’s vaccine due dates. 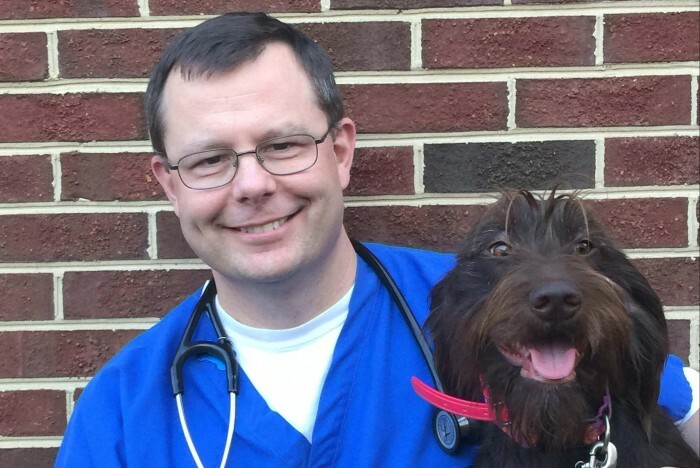 “It doesn’t just improve patient care, but it also helps pet owners feel more connected to their veterinarian,” says Mark. It was during a lecture on healthcare IT that Mark says he had his “lightbulb moment”, something he didn’t think existed until he enrolled at business school. His professor was talking about an integrated network of medical and personal health records that human patients can dip into on demand. Unfortunately, in Mark’s field, his patients can’t voice their concerns, allergies, or underlying health issues to their doctor. Hey presto, the seeds of VitusVet were planted, and so began the initial stages of gathering information and undertaking research. “Back then, and even still, we benefit from the super smart people at the Smith School, who help us navigate some of the challenges of startups and now early stage companies,” Mark explains. Now flying full-time with VitusVet, Mark says that his education in data analytics—one of the school’s strong spots—is paying dividends daily. He highlights classes on data modelling, and learning about the software tools available to increase the quality of your data sets and analysis as key. “There’s always a risk in business and you’re just trying to minimize it,” he asserts. “It really resonated with me, because as a practicing vet I wanted to minimize the likelihood of making mistakes by learning from other people. Mark isn’t content though, and as someone whose mind is geared towards lifelong learning, he’s continuing down the data analytics education path. He says that him and cofounder Kalpesh are working on a joint project to undertake with the Smith School. Specifically—given the amount of data they have on their patients—are they able to find hidden trends within the data that could help pet owners take better care of their pets. It taps into the power of data analytics, Mark says, especially for new businesses. VitusVet has gone from a lightbulb moment to a fully-grown communication platform for veterinary practices in the US. Their goal for the future, Mark says, is to continue to help practices evolve in the 21st century landscape. “If you think about all the multibillion-dollar companies that have arisen over the last five to 10 years—Amazon is a prime example—it’s about how do I make this dramatically simpler for my customers to do business with me,” he explains.